As well as being a gateway to Grand Canyon National Park, the college town of Flagstaff, Arizona, has a vibrant gay nightlife. We've gathered information on the best places to hang out here and in nearby Williams. 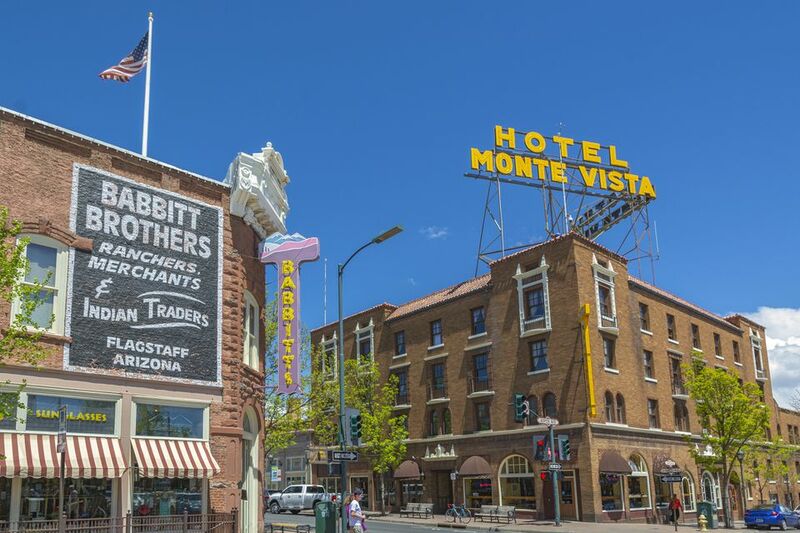 In Flagstaff, one place with an especially gay following is the bar at the historic Hotel Monte Vista (100 N. San Francisco St., 928-779-6971), a grand (albeit by no means luxurious), a vintage downtown hotel famous for its giant rooftop neon sign. There are two hangouts off the lobby of this 1927 landmark, the Rendezvous Martini Bar, which during the day becomes a coffeehouse, and the cozy Monte Vista Cocktail Lounge, where you can often listen to live bands. There are several pool tables here in the billiards lounge, and the bar serves up a nice mix of cocktails, wines, and beers. Serious beer aficionados should stroll a short distance to Hops on Birch (22 E. Birch Ave., 928-774-4011), a cool storefront bar that specializes in craft brews - there are more than 25 on tap, typically including beer from Cosmic, Wanderlust, Great Divide, Anderson Valley Dogfish Head, and several more. Just south of the tracks and Route 66, Beaver Street Brewery (11 Beaver St., 928-779-0079) is another great spot for microbrews - you can sample in-house favorites like Hopshot IPA and R&R Oatmeal Stout, and there's an extensive menu of wood-fired pizzas, sandwiches, salads, and similar comfort fare. Offbeat and fun Pay in Taking (12 W. Aspen St., 928-226-8595) is both a quirky convenience store and a fun little bar with a retro-hipster vibe - here you can order a craft beer, a glass of wine, fine coffee drinks, and potent margaritas. The staff is friendly, and the bar supports a number of local charities. Other good bar options in downtown Flagstaff include Uptown Pubhouse/Uptown Billiards (114 N. Leroux St., 928-773-0551), a great place to shoot pool and quaff ales and cocktails; and Charly's in the Weatherford Hotel (23 N.
Leroux St., 928-779-1919), which like the Monte Vista is a historic hostelry (ca. 1897) exuding character. Charly's Grill is the restaurant, serving very good American and Southwestern fare (burgers, omelets, burritos), and Charly's Pub is a fun place for drinks and watching live music. Among coffeehouses, Flagstaff has plenty of inviting options, with gay-popular Macy's European Coffeehouse and Bakery (14 S. Beaver St., 928-774-2243) especially worth checking out for its rich espresso and coffee drinks, plus big salads, sandwiches, and tasty baked goods. Macy's is a real force in the arts community, presenting poetry readings and live music - this eco-friendly café that brews fair-trade coffee is open daily from early morning until 8 pm. Flagstaff, like many college towns, has plenty of affordable delis and cafes, ethnic restaurants, and similar hangouts - just stroll around downtown, and you'll see lots of options. But in recent years, this increasingly hip town in the northern Arizona mountains has developed a crop of seriously outstanding restaurants. Several hot spots vie for top acclaim among discerning diners, with Tinderbox Kitchen and Annex (34 S. San Francisco St., 928-226-8400) arguably the best of the bunch - this sleek, warmly furnished bistro could hold its own in any big city, both in terms of its sophisticated cocktails list and its first-rate, regional American cuisine and artisan charcuterie menu. Much of the food here has a Southern influence, such as slow-roasted pork belly with creamy blue cheese grits and cherry chutney, and while braised hog jowls with tomato, olives, capers, orange, and orzo pasta reflect some Mediterranean sensibility. Other notable eateries in town include romantic Josephine's (503 N. Humphrey St., 928-779-3400), a contemporary bistro set in a beautifully restored Arts and Crafts bungalow with lovely indoor and outdoor seating (especially nice for brunch); Brix Restaurant & Wine Bar (413 N. San Francisco St., 928-213-1021), which works closely with ranches and farms around the state to create a seasonal menu of superb mod American fare (wild boar chops with chimichurri and fig compote, heirloom beet salad with local chevre and black-truffle vinaigrette); and eclectic Mountain Oasis (11 E.
Karma Sushi Bar Grill (6 E. Route 66, 928-774-6100) is a stylish, chic venue serving fine Japanese and Asian food, from sushi rolls to green mussels with sake cream to spicy squid salad. And Criollo Latin Kitchen (16 N. San Francisco St., 928-774-0541) does a commendable job with artfully presented, creative Pan-Latin fare - try the carne asada tacos with a jalapeno glaze, shrimp ceviche, and guajillo-barbecue duck breast. Just 35 miles west, in the town of Williams, you'll find a few more fun places to drink and eat. A rugged small town that's the gateway to the Grand Canyon's South Rim (which is just 60 miles north), Williams fills up with tourists from all over the world in summer, though it's not as liberal as Flagstaff and has far fewer gay residents (though plenty of GLBT tourists in summer). There are a couple of very fun, rollicking, mostly straight dive bars in the historic downtown, where you'll occasionally bump into "family": the Sultana Bar (301 W.
Route 66, 928-635-2021) and the particularly friendly and atmospheric Canyon Club (132 W. Route 66, 928-635-2582). Red Raven (135 W. Route 66, 928-635-4980) is a terrific little bistro serving creative American fare. For breakfast or a caffeine pick-me-up, stop by Grand Canyon Coffee & Cafe (125 W. Route 66, 928-635-4907). The atmospheric Spenser's Pub at the historic Grand Canyon Railway Hotel (233 N. Grand Canyon Blvd., 800-843-8724) is another favorite. And up at the Grand Canyon (about 80 miles northwest of Flagstaff), one of the most atmospheric places to enjoy dinner or have a drink at the bar is the historic El Tovar Hotel (Grand Canyon South Rim, 928-638-2631). Also keep in mind that the gay-popular high-desert resort community of Sedona is just 30 miles south of Flagstaff, and if you're really up for a big night of gay clubbing, Phoenix is about a two-hour-and-15-minute drive.